Sigsbee Reservoir, Erie, PA's largest drinking water source, trusts XR5 geomembrane for years of proven performance. Sigsbee Reservoir, built in 1873, is the largest potable reservoir in Erie, PA and is responsible for providing more than 30,000 residents with safe drinking water year round. The reservoir holds more than 34 million gallons of water and reaches 30 feet at its deepest point. Located on the edge of the infamous Great Lakes Snowbelt, it was important that the membrane could withstand four seasons of weather, including brutal winters. 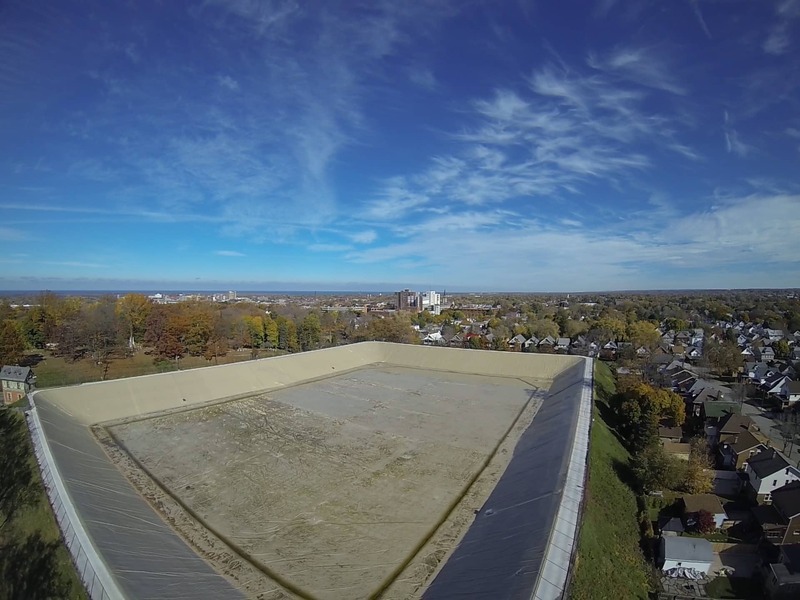 Erie Water Works, owner and operator of Sigsbee Reservoir, contracted JH Waters to pre-fabricate and install Seaman Corporation’s XR5 8142 Geomembrane liner, totaling 520,000 sq. ft. Renovations of the reservoir began in June 2016, starting with the removal of a center divider that would improve water circulation. This was by no means an easy task—nearly 7,000 cubic yards of dirt were removed in order to displace the divider. By November 2016, JH Waters had installed the liner on the reservoir—just in time for the winter months ahead. “We love the repairability of the material…I could see it lasting 25, maybe even 30 years,” said Hutchins. XR-PW is the membrane preferred by more engineers and utility owners for the containment of potable water. This high strength, puncture, tear and UV resistant membrane is the only coated geomembrane with NSF-61 approval for potable water contact. Whether used for finished water baffles, raw water ponds or other potable water applications, XR-PW Geomembranes retain their flexibility and perform better than any other membranes in the world. “The XR Geomembrane performs well in harsh winter conditions,” said John Hutchins of JH Water Systems. For over 40 years, XR-5 has been used by engineers who have needed the strongest geomembrane for use in the world's harshest conditions. Backed by over 60 years of coated fabric technology, Seaman Corporation's XR-5 is the highest-strength and most chemically resistant geomembrane on the market. XR-5 was developed to contain and protect against acids, oils, methane and alkalis. Across the world, XR-5 is being used for pond liners, secondary containment, floating covers, and wastewater baffles.